Autism Spectrum Disorder being the highlight of the month of April, spreading awareness is vital to integrate members with special needs into the workplace, in line with Diversity and Inclusion principles. Diversity is the full range of ways a person can identify themselves through differences, that include, but are not limited to, physical abilities or traits, mental health, educational backgrounds, personality types, experiences, age, race, gender, social class, religion. Thus, it is not necessarily measurable or visible. Inclusion on the other hand, is about recognizing the worth and pride of all people, through involvement and empowerment. 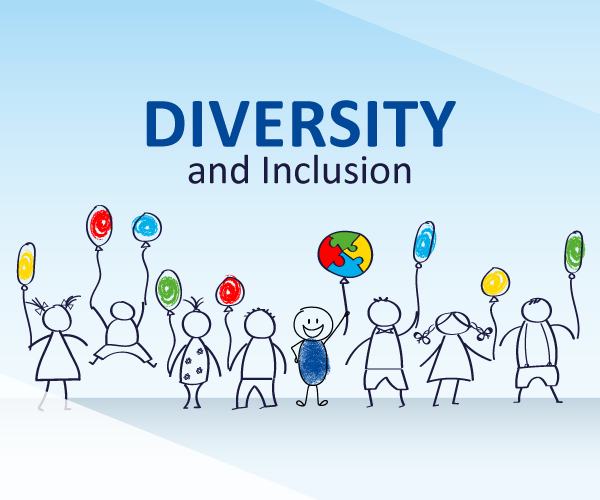 Inclusive organizations promote a fair sense of belonging by valuing, hearing, empowering and practicing respect for their diversified workforce. It goes beyond just tolerance and puts the focus on celebrating and elevating every person within the team! Often invisible, and widely misunderstood, autism remains highly stigmatized. Autistic employees are often disadvantaged when it comes to landing a job or simply maintaining one because of difficulties with social interaction, soft skills, and due to a lack of information and understanding of autism. In that context, organizations worldwide continue to struggle with how to properly address and integrate individuals with disabilities in the workplace. As a result, according to “Autism Speaks”, an organization dedicated to advancing research into causes and better treatments for autism spectrum disorders and related conditions, employers often miss out on the qualities and talents shared by employees with autism. These include but are not limited to, strong attention to detail, commitment to quality and consistency, honesty, loyalty, creativity and “out of the box” thinking, excelling in repetitive tasks. These qualities have been verified by businesses that have benefited from recent autism-specific hiring initiatives, including but not limited Microsoft, SAP, Walgreens, Zenith Optimedia, and a growing list of other acclaimed corporations. • Maximize the existing support system and get to know each autistic employee individually. It is vitally important to accept and understand that no two autistic people are the same. It is also essential to educate the team about autism, and train members on how to embrace it without undermining autistic colleagues’ abilities, capabilities and/or feelings. This will help the team to be more considerate about the challenges and behaviors of people on the autism spectrum, and be more convivial to their new team member(s). • Foster a positive, supporting and well-structured environment. Giving information about changes to the workplace or tasks well in advance is important to autistic employees. Helping them prioritize tasks, organize responsibilities into a timetable for either daily, weekly and/or monthly tasks, and finally breaking complex tasks into smaller organized steps is fundamental for their success. Writing instructions or asking the person to repeat them back is another technique to make sure things are clear and well-understood. • Orientate and on board the new employee(s) while giving continuous clear and structured training. Prior to the first day on the job, employers must be very specific by telling the new employee(s) exactly what time to arrive, where to go, who to ask for and what to wear. It is also very helpful to have their workstation set up before the start date. To ensure a proper integration, assigning an office “buddy” who can walk them around the workplace is ideal to help with providing appropriate support and guidance, be their go-to person about office protocols, and rely on for on-the-job training as needed. Outlining the productivity expectations for the first day, week, month and trimester is also a good practice of on boarding. it is also a good idea to provide the new employee(s) with the company’s HR policies and procedures, with precise instructions to read them within a certain time frame. • Give clear, concise and specific instructions and performance feedback. Employers should explicitly explain the job description and the expected outcome through clear instructions about how to carry out each task from A to Z as ground foundations for good working practices. It is also recommended to carry-out regular brief one-to-one sensitive yet direct meetings with the autistic staff member to discuss and review performance, and finally give overall comments and suggestions. • Ask about sensory distractions and give autistic employees the flexibility to customize their working environment by suggesting screens around their desk, noise-cancelling headphones or desks located in the corner areas of the room for instance. Human Resources professionals, savvy Marketers, and Business Development experts already recognize that capitalizing on the ROI of employing people with disabilities, reflects the $3 trillion market globally that is controlled by persons with disabilities. That said, having a diverse environment also reflects on the business side. In a recent McKinsey study, research showed that many successful companies regard I&D as a source of competitive advantage, and specifically as a key enabler of growth “Diversity matters because we increasingly live in a global world that has become deeply interconnected. It should come as no surprise that more diverse companies and institutions are achieving better performance”! According to Salesforce, “The business of business is to make the world a better place and that companies can be powerful platforms for social change”. Bottom line: Diversity and Inclusion is vital for the business’ success and for making the world a better place – we’re all equally responsible for embracing it!